I may have gotten a C in Algebra, but if theres one thing I know, its that bacon + anything = win, I call it the Bacon Equation. A few minutes ago one of my coworkers let me try a Bacon Olive Spread his wife made and let me tell you, it was heaven. A quick search on google yielded a few Bacon Olive Spread recipes, but none seem to have the flavor profile of the one I just tried. This one tasted both vinegary, salty and sweet all at once while many other recipes seem to stick to the salty savory profile. Im guessing it was made with Spanish olives blended with hickory smoked bacon and a balsamic reduction of sorts. I willl experiment with this recipe and report back. Until then, please enjoy proof of the Bacon Equation. Perfect for heart attacks…delicious heart attacks. 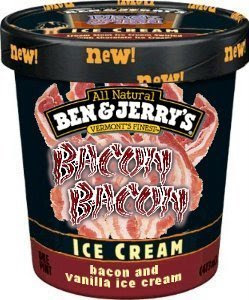 I have a recipe for this myself that I will share shortly…I just want to know why Ben and Jerrys has not come out with their own bacon ice cream! Sadly that photo is a photoshop…and a dream. I would put this on everything and I mean EVERYTHING. Think of it, bacon salted edamame…droool. The fabled and eloquently exquisite bacon chocolate bar. I have been blessed to partake in the Vosges Bacon Chocolate bar and it is a sublime blend of bitter dark chocolate and sweet salty bacon. My only complaint is that it needs more bacon. This is my own concoction inspired by the Bacon Chocolate. Unfortunately it was dark out so I couldnt quite get a good image, but heres a picture of me cooking the bacon over an open flame. 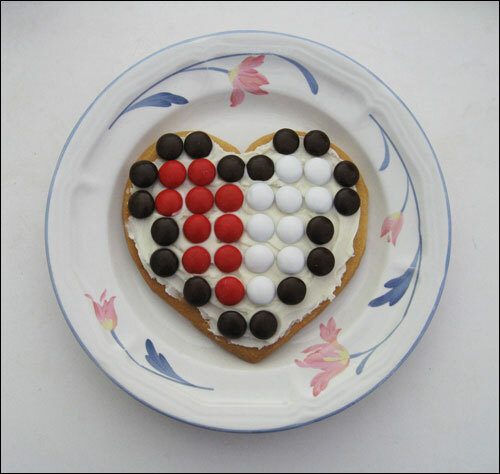 I then took it and wrapped it around a piece of chocolate and a marshmallow. Words cannot describe how delicious this was. I’ll do a proper blog later with nice pictures of this delicacy.